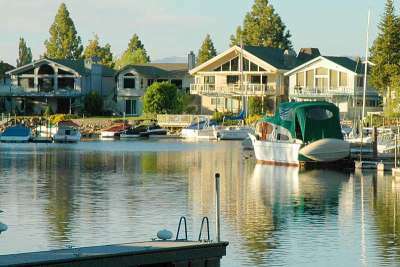 The Tahoe Keys is a private marina community that is seven hundred and forty acres and has approximately eleven miles of inland waterways. Located at the southern tip of Lake Tahoe in the city of South Lake Tahoe, the majority of the 1,539 members of the Tahoe Keys homeowners association who own homes or townhouses have a private boat dock and are located on one of the many lagoons or canals, or they may have a private dock within the Tahoe Keys Marina which is a full service marina with boat launching ramps. Approximately 29 of these waterfront homes have the rare good fortune of being lake front homes. A huge advantage of the Tahoe Keys is its waterfront living with direct access to Lake Tahoe for boating, water sports, and fishing. Additional amenities included at the Tahoe keys include indoor and outdoor pools, tennis courts, volleyball courts, and a playground area near the club house and private beach. The Tahoe Keys is level topography bringing the residents spectacular mountain and lake views. With great sun, wide streets, easy access and good snow removal you will often see Tahoe Keys residents taking nice winter as well as summer walks. The Tahoe Keys neighborhood is close to the ski slopes and winter sports, and is just a quick ten minute drive to the downtown Casino, night life and entertainment. Within the Tahoe Keys neighborhood you will enjoy the Fresh Catch restaurant with indoor and summer time outdoor dining, the Sierra Athletic health Club and Mountain Yoga. There are walking paths that weave through the meadow to the Lake, and bike paths leading to many of South Shores best beaches; Pope Beach, Kiva Beach (dogs allowed), and Baldwin Beach. If your dream includes “A Boat and dock in my back yard”, there is not a better value anywhere around Lake Tahoe that will provide that amenity and so much more!